compass operation: Please put the compass flat on the floor for the accuracy, any tilt would affect its direction. flashlight operation: 1.Please kindly follow our steps to use SOS and strobe mode. 2. Long press the side button, two LED light will lit on. 3.Continue to shortly press the side button, it will enter into SOS mode. More once, it will enter into flashing or storbe.Next short press will turn off the charger. Features: Battery type: Li-polymer battery Solar power: Single crystal 1.5W Application type: commonly used material: ABS+PC+ Silicone Capacity: 10000mAh Input: DC 5V/1.0A Output: DC 5V/1A DC 5V/2.1A charging time: 12h Specification: Product Dimensions: 5.47*2.95*0.79in Package Size: 7.76*4.72*1.38in Product Weight: 9.21oz Package weight: 11.99oz Packing List: 1* Solar Power Bank (a compass adhered to the back of the power bank) 1*Hanger 1* USB Charging Cable 1* Manual Kind note: 1.In order to fully activate the battery, please charge it via outlet or computer for 10 hours at least at the first 2-3 uses. 2.Fully charging by outlet takes approximately 10 hours. Do not charge it all day nor over voltage. 3. For safety, DO NOT leave the power bank charging in car in case of high temperature and avoid crashing. Do not make charge while charging itself. 4. The energy transformation from solar to electricity is rather slow and the solar charging speed is subject to sunlight intensity and panel conversion rate. In daily life, we highly recommend charge it via wall outlet. 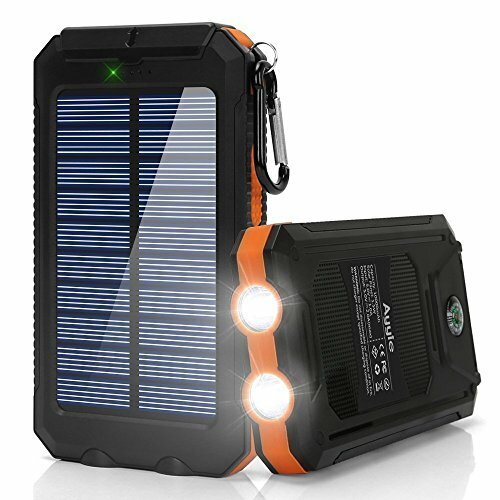 ★ Portable solar charger: Solar phone charger, featured with compass(not as precise as profession one) and 2 bright LED flashlight. Awesome for outside activities such as camping, hiking and other emergency use. Made of durable and reliable ABS+PC+Silicone material, protects it from rain, dirt and shock / drops. ★ Compatible with your iPhone, Samsung, HTC, Nexus, Go-pro Camera, Tablets and other USB devices. More than 1000+ recharge lifecycle. Solar Charging Travel Powerbank with Flashlight / Carabiner, Very reliable and durable. ★ Smart Express Charge - Just connect your devices to the solar power bank, it will automatically detect the charging requirements from your devices and provide max speed up to 2.1A per port, simultaneously charge 2 devices is available. ★ The solar powered charger, equipped with compact solar panel, which can recharge the battery itself under sunlight. Also, you can use USB cable to full charge it for 7-11 hours.Please note that the solar charging function depends on sunlight intensity and conversion rate.It will take a long time to fully charge, which is suitable for EMERGENCY Outdoor Camping Travel. ★ Best service for solar charger: 12 months Warranty,24h onlines after-sales service,Friendly replace policy.